I am incredibly vain about my hair. I always have been, and I can’t foresee a future where I am not. But my hair is often not my hair. I colour it to hide the mousy brown colour it naturally is. I smooth out the natural waves and gentle curls in my hair until it is dead straight. I hate it. After reading ‘Autoethnography: An Overview‘ I have realised the importance of NOT delving into your own personal story in relation to experiencing a culture WITHOUT analysing that experience. It is important to experience, observe and to question. Autoethnography is a qualitative research methodology that combines autobiography and ethnography. Such a combination ultimately allows the researcher to uncover a large amount of information about a culture. In primary school I developed a love and appreciation for Asian culture. When I was in year three I befriended a Vietnamese girl. I distinctly remember enjoying her company because she introduced me to a completely different world, one that I had previously been unaware of. In my micro world bubble, she brought in macro world elements of Vietnamese culture, including food, music, stationary and other miscellaneous things. This friendship allowed me to garner a more personal experience with the culture itself and taught me to be understanding and sensitive towards it and its values. I feel very enthusiastic about conducting an autoethnographic study on Asian culture. As I have grown older, I have found myself increasingly interested in the way people from this culture express themselves, be it through their eclectic and quirky Harajuku street fashion, their photography, art and/or music. This video provides insight into why ‘decora girls’ dress this way. The interviewer engages in participant observation to gain a deeper understanding of life as a decora girl and why it is such a popular phenomenon. It is a symbol of rebellion against the mainstream values of ‘order and discipline’ that are engrained within Japanese culture. However, the interviewer ultimately communicates that this fashion is an integral part of identity; a subculture signifier. Similarly, from my own observations, this cutesy, kawaii fashion reminded me of that seen in famous Japanese anime, including Sailor Moon and Mew Mew Power. With my current understanding of autoethnography, I would like to work with a group to analyse various elements of Asian culture including food, tv shows, movies, fashion etc. This analysis could be strengthened through interviews and participant observations. The participant observations would be a great way to immerse myself into the culture and to quickly expand my knowledge of it. I feel that these experiences would be effectively documented through video and uploaded to YouTube. I am conscious of doing this in a manner that is objective, respectful and non exploitative. However, I realise that ‘…subjectivity, emotionality, and the researcher’s influence on research…’ are natural parts of the autoethnographic process. Ellis, C., Adams, T.E., and Bochner, A.P. 2011 ‘Autoethnography: An Overview‘, Forum: Qualitative Social Research, vol.12, no.1, viewed 11th August 2017, <http://www.qualitative-research.net/index.php/fqs/article/view/1589/3095>. Let’s face it, the selfie is a part of our everyday lives, whether you get out of bed in the morning to quickly take a good morning shot, or you are bombarded with them as soon as you turn on your phone in the morning, selfie’s are a part of our lives. With the explosion of new technologies and new media, the selfie has become a universal term where one is able to broadcast themselves to a wide, and selfie-crazed audience and this is being seen not only at arm’s length in our day to day lives, but is actually all over the world, including Japan. What I learnt from this experience? When thinking about this I really wanted to delve in further about what the selfie actually was, how the selfie actually worked and how it has become a universal phenomenon. In this day and age, it is so common to publicise ourselves to digital audiences through social media sites such as Instagram, Twitter, Facebook, Youtube etc that it has become a norm enabling us to communicate ourselves in a completely new way. Through the development of new media and technologies, the fact that audiences are no longer just consuming what they see in the media, and are constantly evolving becoming pro-sumers and citizen journalists are a clear way how audiences are striving to be a part of social communities and are using selfies to be a part of it. When thinking about this, I thought about the way that cultures cross over because of the way that there are so many sub-cultures that interact with each other around the world, and the biggest one of these is the digital culture. In the article, Art at Arm’s Length: A History of the Selfie, Jerry Saltz writes that “We live in the age of the selfie” In this article, the selfie is discussed as becoming ‘become their own visual genre- a type of self portraiture formally distinct from all others in history. Selfies have their own structural autonomy’ and as Saltz describes, selfies are ‘a very big deal for art’. What are my reactions towards my findings? Initially when I started thinking about the selfie as being an art form, and being a universal phenomenon, I have to admit I thought it was all just a bit silly however after reading Saltz article and by seeing how the digital culture and even selfies can bring all different countries and cultures together I found it to be extremely relevant. It is quite interesting to think about the way in which the common ‘selfie’ could be depicted as an art form, and before reading Saltz article, honestly I probably would have never looked at the way that selfies could be a part of artistic culture, and a form of self-expression. However when you think about we have always been taking some kind of selfie, or creating some kind of self representation of ourselves, just think about ancient times even, the drawing on the walls, beautiful self portraits by famous artworks, and more. I think no matter the way you look at selfies, essentially the selfie is a form of self-expression and self-portrait and the reason why it has become such a massive deal all over the world is because it is just a NEW form of representing ourselves, and I think that this is a massive reason why selfies have become such a universal phenomenon not just in the Western countries but also in Japan and countries all over the world. It is well-known that Australia enforces drastic tax fees on all goods, even those produced in our own country! These prices can not compare to those in Asia or the USA. Some thing which we spoke about was the fact that both of us had noted that Oroton, an Australian brand though available globally, was more expensive to buy in Australia than many parts of Asia. This made me question whether perhaps this is why Australian culture does not have large focus on luxury items. For example, Kiki wanted to purchase this Prada Saffiano leather bag. In Australia it was retailing online for $3525.50. 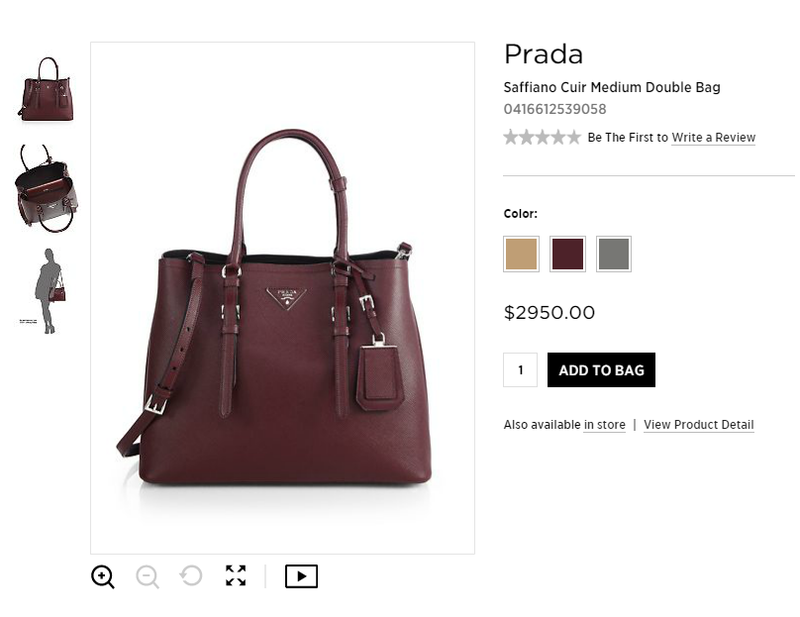 This is not the store price, which she informed me was even more than this, as opposed to buying the exact same bag in the US, (instore/online price at Saks Fifth Avenue) for $2950. Now when we consider the exchange rate, this may not seem like much of a saving, though for someone who buys in bulk and this purchase is merely an accessory, these savings can total $100’s, even $1000’s of dollars. Australia certainly has a substantial fashion presence, with designers which are recognized globally, such as Ellery, Manning Cartell, Aurelio Costarella, Zimmermann and Josh Goot, though these brands are considered ‘luxury,’ they do not compete with European or American designers such as Chanel and Prada. There are on a different global scale for many reasons. The companies are no where near as extensive as these mentioned European brands, they are not as established and do not receive the same global attention. Where the products may prove to be a high quality standard, they are not using such premium materials, thus they can not charge such disproportionate prices. There is not a large market for luxury designer labels in Australia. Just to search the availability of the items both online and in-store gives us a rough idea of the buying power in each country. I had a look at Australia, USA and China, to note how many Prada stores are available for consumers. I found that in this vast, enormous country, Australia we have merely four stores; Sydney, Melbourne, Gold Coast and Perth. Where USA has 18 stores across the country and China has 16 alone, this does NOT include the mass of stores throughout Japan and South East Asia. When speaking to Kiki about this, she was not surprised and said she’d noticed that those Australians who did own luxury fashion items, were generally 40years or older. Whereas, where she is from, it is more common to see younger people sporting Chanel and Dior. When asked why she believes they spend so much on these items, Kiki found the question hard to answer. I asked her why she spends so much on these products and she stated that ‘she felt proud to wear her Prada bags.’ These items symbolize status in China and can present opportunities for you which you may not find with a cheap imitation. I found this very interesting, as I pondered what kind of opportunities she meant. This leads me to my next weeks post!! I will include further information about our interview and I am going to have a look into a bit of Chinese history! In order to ensure that I am on track with my auto-ethographic study, I have done some research on the best methodologies to choose for my study. As I already had an idea of the methodologies I would like to pursue, having further read about them, I am able to critically analyse whether I made the right decisions. To begin with, I would like to establish a definition auto-ethnography. As I did this in one of my previous posts towards the beginning of the semester, I will reflect on what I have learnt from there. According to Ellis (2004) & Holman Jones (2005) auto-ethnography is ‘an approach to research and writing that seeks to describe and systematically analyze personal experience in order to understand cultural experience.’ Rick Sheridan (2014) explains that auto-ethnographers write narratives about what they experience, making themselves a primary participant and/or subject of the research. Upon reflection of my own understanding several weeks ago, I can establish that within my research on the significance of luxury fashion items and their prevalence on social media, I will need to embody my research in order to make it an auto-ethnographic study. I will be performing reflexive, dyadic interview with a friend of mine, Kiki, who was born and raised in China. 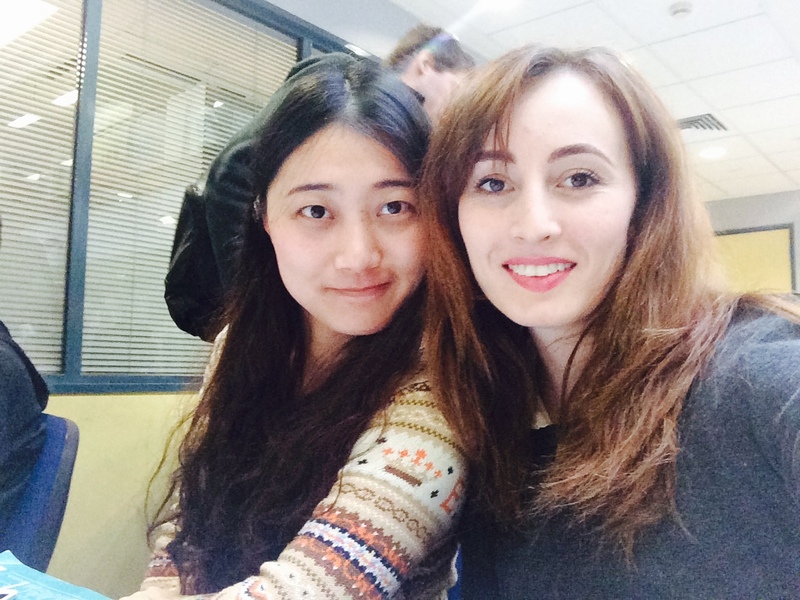 She will prove to be an interesting interviewee as she is interested in the fashion world and has experienced the differences in both China and Australia, having lived here for 3 years now. As stated by Ellis (2004), this dyadic interview will be heavily focused on my interviewee, though she will be taking into consideration the reason why this study is being taken place. Although her and I would often speak about fashion, performing such an interview will change the dynamic of our conversation. Tumblr. Tumblr is a micro-blogging, social networking platform on which individuals can post various multimedia under a title which is linked to their name. It is actively used by 197.3 million people as of the 1st August 2014, according to the ‘about us’ section on Tumblr. (1) It was bought by Yahoo! on the 20th of June 2013 and the founder of Tumblr, David Karp remains the CEO till this day. Tumblr is mainly compiled of images. These range drastically in their content and are also often ‘re-blogged’ by individuals who want it to appear of their page. The site has found that as of 1st August 2014, an average of 95 million posts were blogged per day. (2) This was a leading reason for my choice to use Tumblr as my digital artefact. Other reasons include the fact that I have never used this platform before, so it will be a great opportunity to get to know the site. 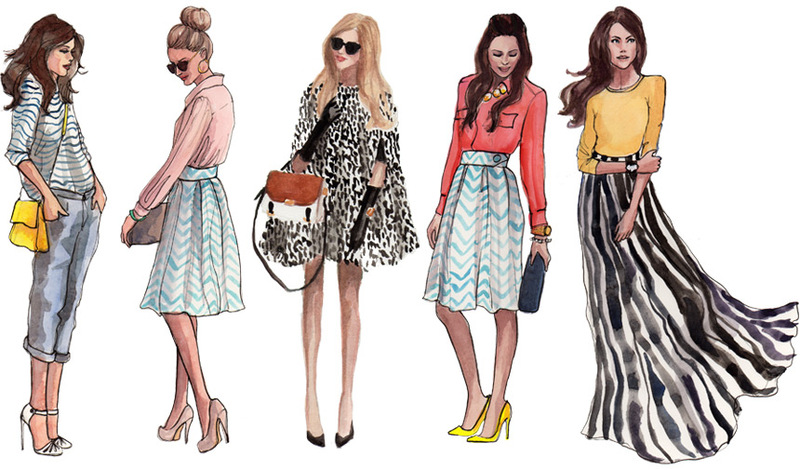 Also, throughout my research of this topic, I found that Tumblr is a very popular media platform for fashion bloggers. From here, I will be searching through some well-known and popular fashion blogs and also seeking smaller, local blogs and making comparisons between them. I will look at what aspects of these blogs make them popular and whether it has to do with the items that the individuals are wearing. This will make up the content analysis sector of my auto-ethnographic study. With this information, I will attempt to take the results which I have found and make my own fashion blog, through Tumblr. I will note down details such as the number of times my images are re-blogged, views and which posts gain the most attention and why. I will also take a look into online spending habits across different brands and whether individuals purchase luxury items online or offline. Luckily, I am capable of obtaining information on Jimmy Choo and Michael Kors purchases throughout Australia and numerous different countries in Asia. I am also able to see how much of this shopping is done online. This information will broaden my knowledge of luxury item expenditure. I also plan to speak to a friend of mine who was born in China about her opinion on spending and luxury items. It will be interesting to have a personal view on the topic as she will have some inside knowledge or opinion. Tumblr “About Us”. Tumblr. Retrieved August 1, 2014. This week in DIGC, when deciding on selecting a different element of Japanese fashion and the way that it is displayed on the app, Instagram I came across a phenomenon which I never even knew was so popular (especially on Instagram). During this course, I have focused a lot on the way that Western societies and culture have influenced Japanese fashion however I did not realise how strong the impact that Japanese fashion was on Western societies and its fashion. When I was looking around on Instagram for some ideas for my autoethnography, I find many young girls dressed in bright colours, pastel pinks and resembling that of Japanese girls however would be of Western descent and coming from countries of Western culture such as America, Australia and Sweden. This got me really thinking about the different ways that the Japanese fashion culture influences Western culture in both minimal and massive ways. To maximise my analysis and evaluation on the topic this week, I have taken questions from this week’s Prezi slide to assist my evaluation. As I have briefly mentioned above in my first paragraph, I did not intentionally go out and decide on the topic of Japanese influence, and actually stumbled across it in the way that I was researching Japanese culture and fashion for my autoethnography. What were my first reactions and feelings at the time, how did they change? When first encountering this aspect, I simply typed into the search bar “Japanese fashion” and was so surprised to see that the third image across the page was a young Swedish girl, Rin, in two straight pony tails, and about 11 hairclips and scrunchies in her hair. The image had also been done by some sort of anime application as there was hearts, flowers and diamontes spread across the image. Once clicking on this image, I found that the caption was actually that of lyrics by famous Korean band, 2NE1 famous in Japan who I discussed last week. My initial feeling toward this was that I actually felt quite surprised. I always kind of knew that Western culture had an influence on Japanese fashion however I did not really look at it from the other way around. 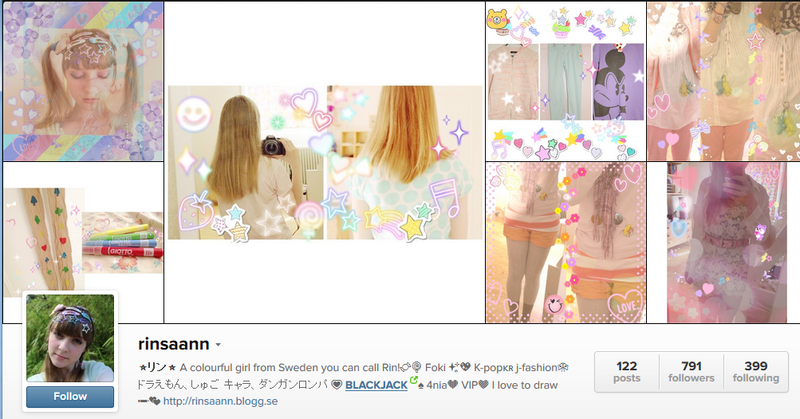 After I had a little look on “Rin’s” instagram, I went back to the general search on Japanese fashion and was actually surprised on how massive this influence actually was. In analysing this, I am also reminded of famous American singer, Gwen Stefani and the way that Japanese fashion, especially the Harajuku style has had such an influence on her style not only in the way she dresses herself however also on the products and collections that she has including the “Harajuku collection. After this analysis, and what I could actually call an epiphany, I actually questioned the reasons why I have never really noticed this before. Is this part of my culture, the way that I seem to have completely dismissed the influence of other cultures in my own life and culture however am very aware of Western culture influencing other culture? I am really looking forward to unpacking this more as it is amazing how I have never really thought about it before even though it seems like a massive part of my life and our society. Hmmm What do you think? I really want to unpack this further and will continue this research in my next blog! 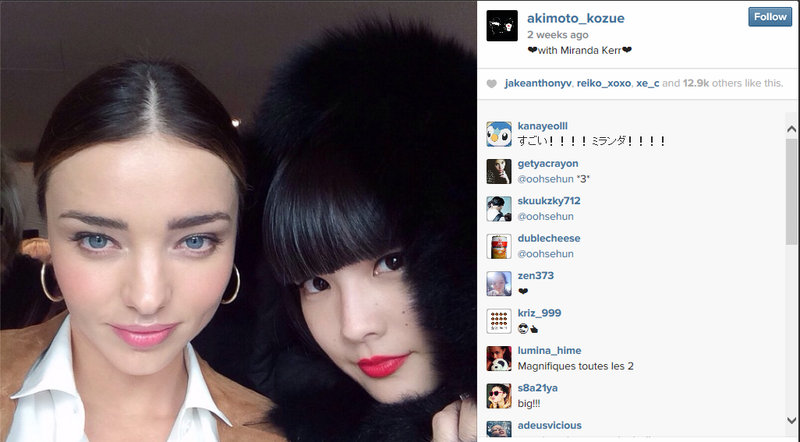 This week I took a look at the ever-present ‘instafamous’ female, across Asia and the Asian diaspora. I questioned what these individuals post and why? I also noted the most exciting aspect of the blogging experience, the views and opinions of the audience! I also delved into the use of the hashtag as it is a means of connecting oneself to a brand or label. It is overly common to come across a fashion blogger these days. If you are to type ‘international fashion blogger’ into google, not only do you receive nearly 60 million hits, but the initial results consist of a series of ranking systems. There are a series of top 100 lists in which most include numerous blogs written people from all across Asia. One particular website, ‘Signature 99,’ lists the top 99 most influential blogs in the world. According to this site, a blog entitled ‘Hypebeast’ written by a girl from Hong Kong ranks #6 and is in the top .1% in the world. Commonly these blogs include images of the blogger and their new purchases or daily outfits and they link these products to the according site or even sell the product itself. As I follow several bloggers and Instagram accounts myself, I constantly note the prevalence of luxury items. I also find it interesting that these items seem to be ‘hashtag-worthy’ as opposed to some that are not. This particular example is Kryz Uy from the Philippines. Uy is a luxury fashion blogger who posts images across the globe, on her travels and as seen in this image, she presents herself with brands such as Chanel. My interest in this is what and why these brands represent such value in the fashion world. Considering a bag like this one in the image retails for approximately $2000AUD or more, it represents a certain meaning for those who recognise it. Whether this meaning is based on your passion for being a part of the fashion world, or whether it means you have copious amounts of money is up to the receiver to interpret. It is an interesting culture and in this particular representation, capitalistic notions are brought about. Fashion is most certainly interwoven throughout the arts and media world, though it can be seen as highly materialistic and superficial. My interest lies in understanding where this boundary is formed, as I personally battle with its two-sidedness throughout my career and personal life.